Greenpeace Brasil’s social media communities have grown furiously in the past 18 months. As we write, Greenpeace Brasil has 548,000 Twitter followers and 240,000 Facebook fans. Greenpeace Brasil is the largest Greenpeace Twitter account — Greenpeace International is next with just over 520,000 followers. How did this happen and why is it important? We spoke with Elcio Figuerido, Web Coordinator at Greenpeace Brasil, to get his insights on how this growth occurred, their strategies, and the power that growing online networks bring to the organization. The growth is no accident. As Elcio points out, it is the result of intense work by a small but very strategic and focused team willing to learn from mistakes and capitalize on successes. 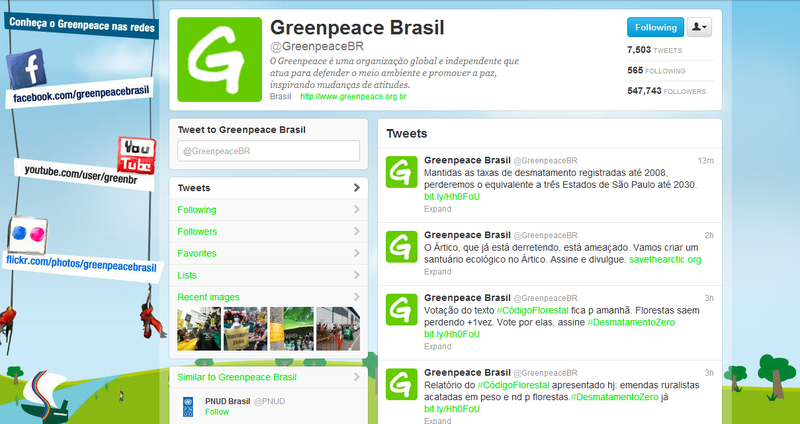 First, a bit more background on Greenpeace Brasil and its history with social networks. Twitter came to Brazil in late-2008. The organization jumped on it early, noting that Brazilians are typically fond of experimenting with new technology. By early-2010, Twitter became big in Brazil and Greenpeace, having jumped in early, was well positioned to grow along with Twitter users. The use of Facebook at Greenpeace Brasil has been more recent. A little over a year ago, Greenpeace Brazil had just 12,000 Facebook followers. They were up to 75,000 in late-2011. Focused monitoring and engagement along with Facebook advertising (discussed below) have been factors in growing the Facebook community to just under a quarter million people today. Greenpeace Brasil has a very small social media team. Currently, Elcio manages most posting and interaction. Others have access and will post but the majority of work is Elcio’s. The communications team is currently searching for another social media staff member. Engagement pathways that integrate social, email and the web. The team committed early on to monitoring social networks and interacting with everyone. The networks of Greenpeace Brasil have never been used as a broadcast platform. As Kiko Brito pointed out, “our goal is not polemics, it is to mobilise people.” Personal interaction gives social media followers confidence in the organization and its people while helping staff identify who is most involved. Engaging an online network also builds community. It takes work but its what needs to happen if you want to move from a list of fans to a mobilized community. Ryan J. Davis wrote about the value of engagement recently in an analysis of Wael Ghonim’s book, Revolution 2.0, and the use of social media in Egypt. Picking up valuable ideas and suggestions from the community. Followers asked that offline actions be better tracked in the Ligas das Florestas website (see below). This is being built into the site now. 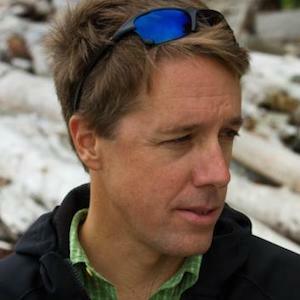 Responsiveness acts as an important supporter service channel. It doesn’t sound exciting but followers know that they can ask questions about issues, the organization or even their donation and will get a response. Customers are happier when they can easily talk with someone at a company. It is no different in an organization. The digital/web team has a stronger role. Campaigners and others around the organization understand that Elcio and the web team have the ear of the online community, can mobilize followers, and have a sense for what people think is important. As Elcio put it: “The guy who works in social media knows all that is going on.” Awareness of the the community and power to get people to take action or attend events gives the social media work real power in the organization. The strength of the social media communities is directly linked to the organization’s direct engagement of community members. This gives the program value and increases social sharing by followers and supporters. The Greenpeace Brasil online community strategy is not just social networks. It also includes a community website. The Ligas das Florestas site is is a hub of online action, particularly around Amazon forest protection. The site also uses games, competition and strong social sharing tactics to promote action and growth of the Facebook and Twitter networks. Typically, one might think that building online community into your website competes with social networks. In this case, the Ligas web community is strongly motivated to share actions that build the Ligas community, social networks, and advocacy responses (signing a petition, for example). If an individual is committed to a cause and you make it easy to share on multiple networks then that person will likely share on more than one network. The Ligas site is an anchor to which messages and supporters on every network can sail back to – an anchor the organization fully controls. The Ligas site gives points to members for the actions they take like signing a petition, sharing a message by email, and sharing on a social network. The organization encourages competition and has seen social networks grow as a result of a strong Ligas community. Participation across social networks drives new visitors to Ligas and, as a result, adds petition signers (and email addresses) to the list. Individual scores in the Ligas community are also used to rank email list members. This data is directly used in the email segmentation strategy. Elcio also points out that recent design changes to the Ligas site have increased social sharing. Social sharing icons were moved to the top of the site from the bottom, making them more visible and significantly increasing usage. 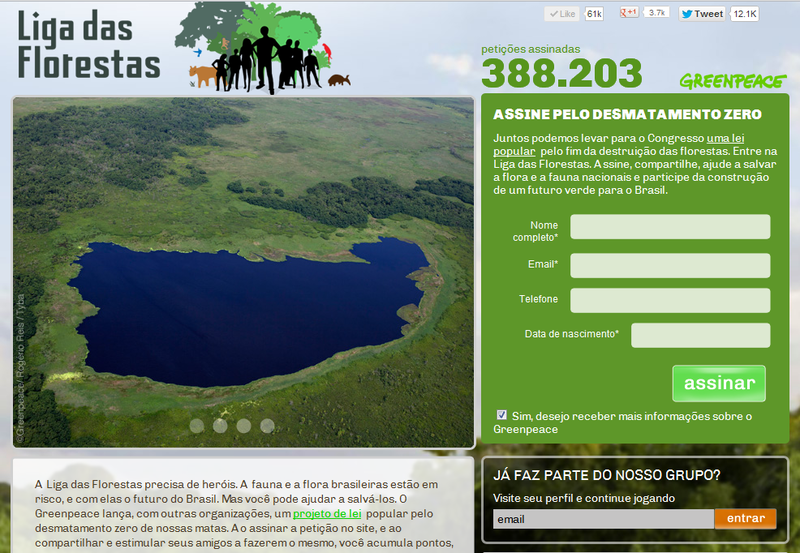 Greenpeace Brasil has successfully used Facebook ads to grow its Facebook following. Ads and sponsored stories led 20,800 people to become Facebook fans. This number doesn’t include new fans from Friend referrals, which aren’t easily tracked. Greenpeace Brasil spent $75 USD most of the time. During bigger campaigns, when the forest code was voted on and during Rio+20, the spend was increased up to $500 USD/day. Ads were most effective when timed with significant offline events, regardless of amount spent. Online advertising also played an important role in growing social networks and email lists at Greenpeace Argentina (find out more). Above, we mentioned that individual activity on the Ligas website adds points to an individual’s profile. These points are used in an email segmentation strategy. Elcio points out that recent email strategies have increased response rates and help move people up to higher engagement levels. People who have signed the Ligas das Florestas petition and share frequently. These people have more points in the Ligas community and could be considered the most engaged. People who have signed the petition but done little else. These people are specifically asked to share and get more involved. People who have an email address in the system but have not signed the petition. They will be asked to sign (and thereby move to the next level). The last two email segments aren’t specifically tied to an engagement path. People who receive a donation ask. Only people who have opened at least three emails receive a donation message. Opening past messages indicates engagement and interest. People in specific regions of the country who are sent messages related to that area depending on need. Prior to this engagement and segmentation strategy, everyone on the list was sent the same message. These emails would typically include multiple asks such as sign a petition, donate, share the message, etc. Clear asks in email messages are a big improvement. Creating an email segmentation strategy that drives up engagement and subscriber action is smart. It’s worth noting that social media activity is integrated into email segmentation. Those who share more through the Ligas community are in a different segment than those who don’t. Elcio at Greenpeace Brasil reports that the email database grew about 60% with the Liga das Florestas/Zero Deforestation Campaign, most of that coming from social media, primarily Facebook. These are estimates, however, because links and referrals were not clearly tracked. It is possible to monitor email list growth from social media but it needs to start at the beginning of the campaign. The team learned from this and plans to track social to email referrals more vigorously in the future. At present, Greenpeace Brasil has not implemented a reliable system for identifying the overlap between email subscribers and social network followers. They worked on that internally for a while but shelved the project. 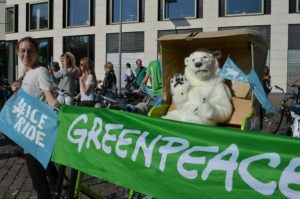 Greenpeace Brasil hopes to begin working with Salesforce later this year to help segment and track online and social data. Want to grow? Engage your people. Investing in social media monitoring and community engagement. Testing and paying close attention to results has helped a small and stretched team prioritize. Social sharing is heavily encouraged and promoted on key websites. Organic growth has been complemented by effective Facebook advertising. Email segmentation strategies integrate social sharing activity. Those who share a lot are segmented and get different messages than those who share less often. Both groups are then able to receive more appropriate messages that encourage sharing and activity better suited to them. This growth has also come at a time of significant social media growth in a large nation with open communications. Brazilians are also known as early tech adopters. These are important circumstances that Greenpeace Brasil seized upon and took advantage of with strong strategies and timely campaigns. Engagement, metrics, testing and integration with other channels were all needed to take advantage of good messaging. Additional input for this story comes from conversations between our colleague, Marianne Manilov of the Engage Network, and Kiko Brito, former communications director at Greenpeace Brasil.